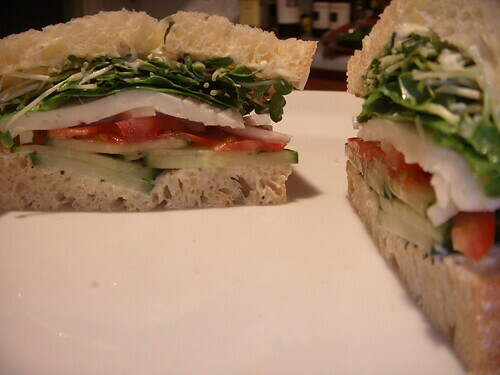 seasoned cucumber summer sandwich, originally uploaded by aarn! +2nd July, 2008+. whipped up a batch of hearty homemade mayonnaise with large grain german mustard, spread that on a few slices of jessica's tuscan pane with some cucumbers which were tossed in some salt, pepper, olive oil, and orange muscat champagne vinegar, tomatoes, vidalia onions, fresh mozzarella, spinach, and raddish greens.